Back to school is an exciting time. It is a huge change from the more laid back summer days of staying up later and sleeping in longer. Morning routines change from a leisurely pace of eating, getting dressed, and maybe even watching some cartoons to a one hour (or less) race against the clock! 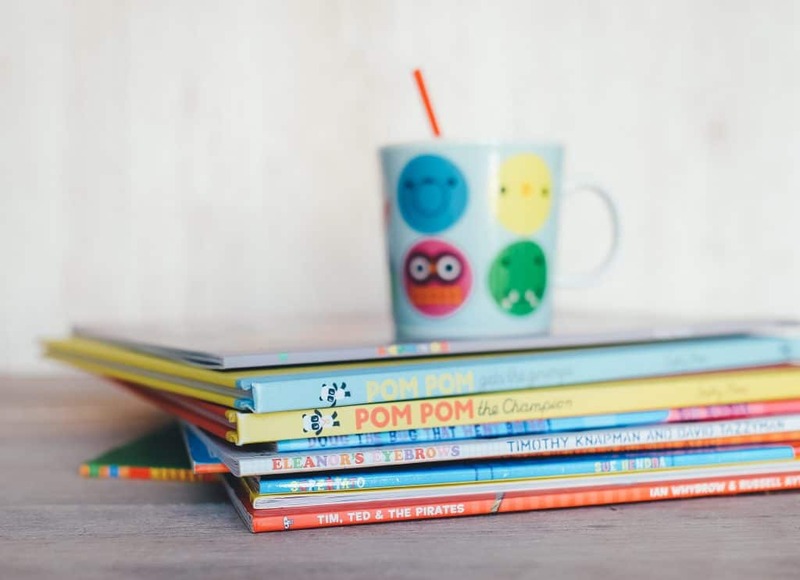 Below are 10 best tips for back to school routines with young kids. 1. Use a simple routine chart/visual aid. Place a simple routine chart in a easy to see place (such as a bathroom mirror) to help kids remember what they need to do to get ready for school. Kids typically do better with consistent routines and schedules for eating, playing and sleeping. Over time, these routines will turn into daily habits your child will do on autopilot! We use a simple one and you are more than welcome to download and use it. 2. Get clothes, backpacks and lunches ready the night before. I have a mom friend who survived the elementary school years by letting her kids sleep in their school clothes for the next day! Her problem was clothing, and sleeping in them provided the solution. We laugh about it now that her kids are older, but I love that she did what she needed to do in order to restore calm to their morning routine. If getting clothes, backpacks and lunches together in the morning is a mad dash of chaos, eliminate it by getting them ready the night before. 3. Get creative with your kid that won’t get moving. If you have to say “hurry” or “we’re going to be late” more than once in the morning, it’s time to get creative with your kid(s) that won’t get moving. I know of one mom who gave her child a lego piece every morning that he was ready to go on time (without reminders) until he collected all the pieces to build a new set. I know of another mom who gave her child a morning checklist and if he got everything done before it was time to go, he could watch t.v. before school. One mom turned her daughter’s lack of motivation to get dressed into a game with a timer. I say use whatever works to get your kid that won’t get moving motivated in the morning and save your sanity in the process! 4. Sign and look over school papers daily. You don’t want to be scrambling in the morning to sign a field trip form or just be finding out your child needs extra practice before a test. When your child is doing homework or right before/after dinner, make it a daily habit to go through the backpack and stay on top of the paper work from school. It can quickly pile up and important notes get lost in the mix. 5. Follow an after school routine. Just as kids know what to do in the morning, it’s also helpful to have some routines in place for after school. This may be putting their backpack in a certain spot, getting homework done before supper, helping with certain chores so that there is time to play later, etc. Part of our after school routine is that shoes and backpack go in the same place day after day. This saves our time and sanity! 6. Start back to school trial run routines. A couple of weeks before school starts, start setting the alarms and adjusting bed times to get closer to what the actual school day will resemble. Waiting until the first day would be a major shock to the system, especially for those night owl kiddos! Get the back to school supplies ready and let your child put them in his or her backpack to start building excitement about the new year. 7. Talk positively about back to school. Talk up “back to school!” This positive talk will help boost our kids’ confidence and reassure them that school is a great place for them to learn and play. I really believe it will make a difference in how our kiddos think about school. We’re doing a countdown on our calendar and looking for opportunities to talk positive about school whenever the topic comes up. I’m trying to do the best job possible of hiding MY worries about a new school year! 8. Create a central space to keep a calendar. Soon after back to school, the calendar gets crammed with extracurricular activities and school events. Create a central space to keep a calendar with all of the activities for the month. This is also a great place to keep the monthly school newsletters or any other essential information to stay up to date and organized. 9. Declutter in the kids’ rooms. Why include decluttering in back to school routines? Because it will help to cut down on confusion and simplify for the new school year. For example, decluttering the kids’ closet will help when it’s time to see what school clothes no longer fit and what is needed for the new year. Decluttering the paper piles will help get a fresh start when school forms and papers start coming in. 10. Automate anything you can. Back to school is an exciting time! 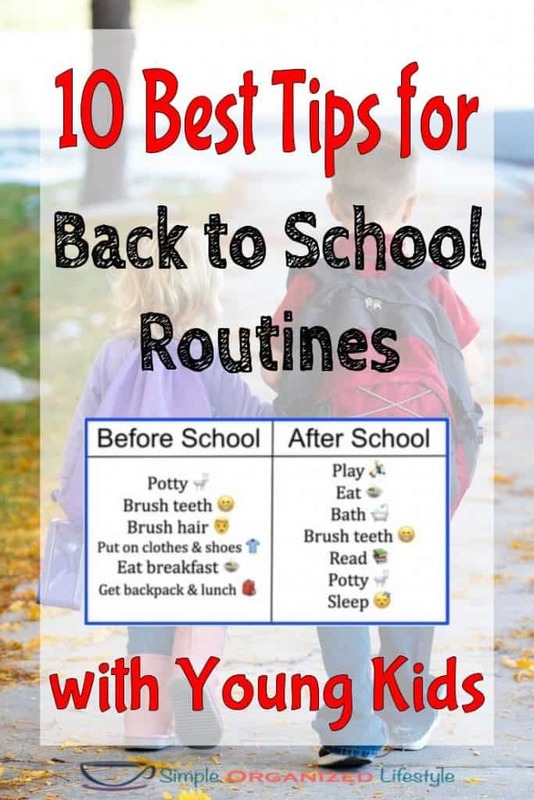 I hope these tips were helpful for getting ready for back to school with young kids. Access my resource library for all of my charts, editable planners and picture schedule chart to help with planning for back to school!